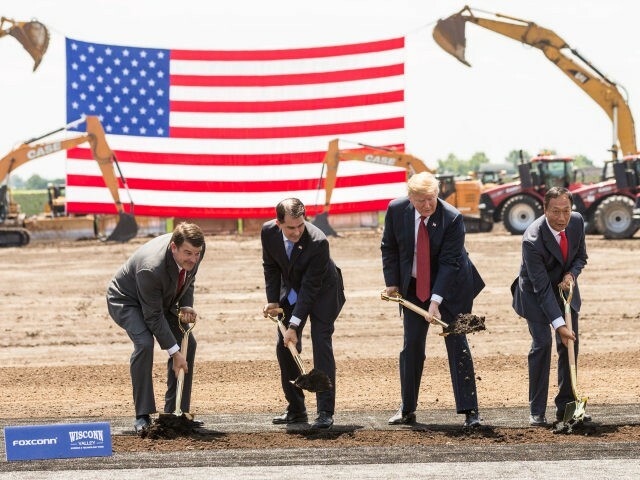 President Donald Trump visited a Foxconn manufacturing facility in Wisconsin on Thursday after breaking ground on a building that will bring thousands of jobs to the United States. The president touted the arrival of the new manufacturing plants in Wisconsin as a result of his tough trade policies, deregulatory agenda, and tax cuts. “As Foxconn has discovered, there is no better place to build, hire, and grow than right here in the United States,” Trump said. “America is open for business — more than it has ever been open for business,” he said. He also credited Gov. Scott Walker for helping bring the vision of a restored manufacturing base to the Midwest. The president joked that he hoped Walker would not challenge him for the Republican nomination. But Trump also defended his tough trade agenda, including his critical remarks about Harley-Davidson after the company announced plans to shift some production overseas. “Harley-Davidson, please build those beautiful motorcycles in the USA, please. Okay. Don’t get cute with us. Don’t get cute,” he warned. Trump said he had a lot of respect for China, Mexico, the European Union, and Canada, but he called for a fair trade relationship. “We are demanding from foreign countries, friend and foe, fair and reciprocal trade,” he said.